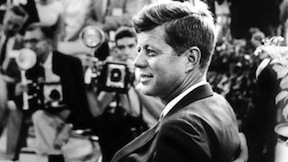 November 22nd marks the fiftieth anniversary of the assassination of President John F. Kennedy. I am just barely old enough to remember that terrible day, but I do remember it--vividly. I recall sitting in my mother's brand new '64 Ford Falcon station wagon with the fake wood panel siding, parked in front of my older brothers' school. Mom had picked me up from morning kindergarten and we were waiting for my brothers to be dismissed--they got out early on Fridays-- when the announcement that made my mother gasp came over the radio: The president has been shot in Dallas. It was only recently that I realized my memory is as inaccurate as it is vivid. I'd been thinking about the upcoming anniversary of Kennedy's assassination and, apparently for the first time, did the math that forced me to conclude I had not been in kindergarten that day--I'd been in first grade. So why had I been picked up early? And did my brothers really get dismissed early from their school on Fridays--or was that a fact I invented because it fit my version of the events of that day? Is it possible that my mother was picking us all up because she already knew what had happened in Dallas? That, in fact, the scene in the station wagon--the initial announcement, my mother's shock--had never occurred at all? My recollection of November 22, 1963 is a "flashbulb memory," defined as a "highly detailed, exceptionally vivid 'snapshot' of the moment and circumstances in which a piece of surprising and consequential (or emotionally arousing) news was heard." Depending on your age, you may have flashbulb memories of the bombing of Pearl Harbor, the Kennedy assassination, the Challenger disaster, or 9/11. Flashbulb memories, like my memory of the Kennedy assassination, are often inaccurate. It's not that the event didn't occur, but the details surrounding one's personal experience of the event may be partially invented. In several experiments such as this one, in which students' recollections of 9/11 and of ordinary events were serially tested over time, flashbulb memories have been found to be somewhat unreliable. Recollections of 9/11 were no more accurate than those of less memorable events, but they were less likely to fade or lose their emotional charge. And the more intense the initial reaction, the more likely the student was to later develop symptoms of post-traumatic stress disorder. In practice, I often hear patients' personal versions of flashbulb memories: a detailed account of an accident or of the moment an alarming symptom appeared or of the day they learned of a life-threatening illness or the death of a loved one. Sometimes, the details don't quite make sense, and I wonder if what I'm hearing is completely true. But thinking about my own flashbulb memory reminds me that sometimes the details don't matter. The larger truth of the emotional impact of the memory of the broken bone or the cancer diagnosis--or a little girl's fear and confusion in the face of scary news from a far away place called Dallas--cannot be questioned.